Rockford Files was not your typical 70s private eye series. James Garner brought a everyman attitude to the genre. He didn’t drive a fancy car or live in a “cool” apartment, his car kept breaking down, he lived in a trailer, albeit at the beach, he didn’t win every fist fight, he kept his one and only gun in the coffee tin in the kitchen and he was always broke. You could identify with Rockford, he loved his Father, wasn’t very good at dating and got arrested about as much as the bad guys did. But we loved him and that love continued for all six seasons until Garner himself had to pull the plug for health reasons. 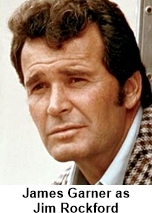 Jim Rockford (James Garner) was an ex-convict (falsely convicted) turned private detective. His closest ally was his former prison cell mate Angel Martin (Stuart Margolin) who would easily betray him if the price was right. 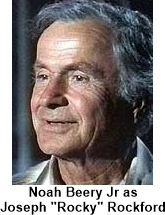 His Father “Rocky” (Noah Beery Jr.) tried to help him but usually wound up getting him in more trouble than out of it. His sometimes girlfriend and always attorney Beth Davenport (Gretchen Corbett) kept having to bail him out of jail for stepping all over the rules about his role and the Police Departments role in solving crimes. He kept a fairly good relationship with Sgt. Dennis Becker (Joe Santos) but they too were often at odds over Rockford’s methods. This series was created by the creator of Maverick, Roy Huggins, which also starred James Garner. The thought was to recapture that magic in a “modern day” setting. He teamed with Stephen J. Cannell, who had written for “Adam-12” and “Chase”, and together they created The Rockford Files. 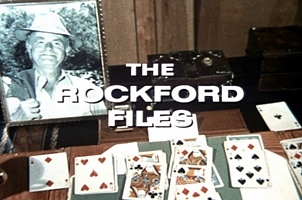 Video Clip of Rockford Files. Even though the character Jim Rockford could never afford a new car every year, the studios deal with Pontiac required them to always use the latest model Firebird Esprit. However for the last two seasons James Garner didn’t like the look of the ’79 Firebird so they continued to use the 1978 model. If your wondering about the last name similarity between James Garner and the actor who played Capt. McEnroe whose name is Jack Garner, wonder no more. Jack Garner is James’ older brother by two years. Jack was a minor league baseball player and then a professional golfer before becoming an actor in the 1960s.